1994. Mt. Washburn sunset. With bad printer lines. The above panorama was once a series of three photographs that were clear and, you know, regular photographs. They were glossy. Clean. Mine. I went through a phase in the early 2000s when I thought I would print every photo I owned in scrapbook format. The corollary? And throw away the originals. What I have now are some images that resemble the photographs but are imminently fuzzier, stranger of color. Many of them have printer lines. But hey, I have less paper to store, so there’s that. (It’s a sad trade, TBH). And yet, the above panorama exists. Mount Washburn has an elevation of 10,243 feet and lies in Yellowstone National Park. You can hike to the top of it. I did. 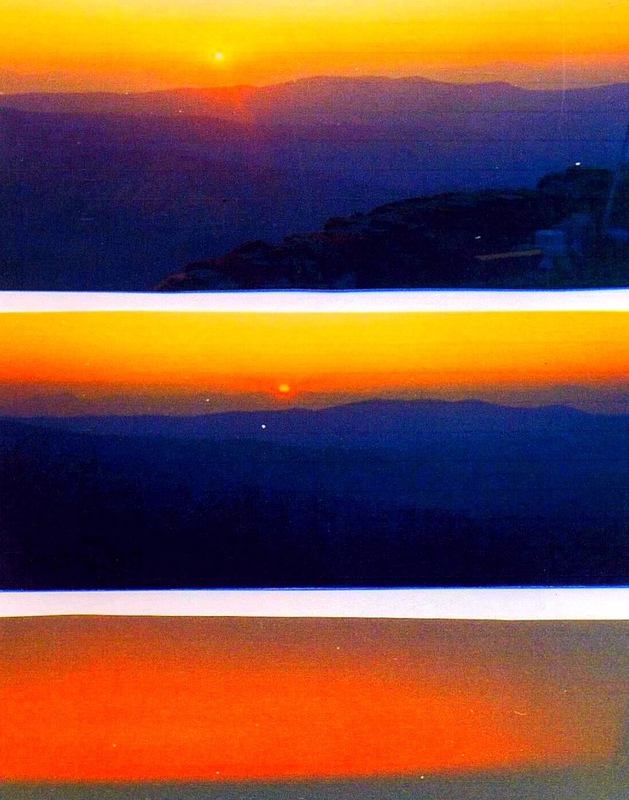 And on the way down, the sun was setting, and with my old-school camera, I took three pictures. Sunset on Mount Washburn. The sky is immense in the West. In Yellowstone National Park, it is limitless, eternal. If you look at it long enough, it becomes otherworldly, much like the pocked and steaming geyser landscapes also found within the park. But at the top of Mt. Washburn, the sky is everything: it is covered by the sun even as it sets. Huge ranges of mountains push up in the distance. There is space, light, shadow, rock, sky. Humans are small and while it’s not the most rigorous hike, well, it will remind you with every step, the universe is large, humans much less so. Isn’t it all amazing? At the top of Mount Washburn, before the sunset, my friends and hiking companions (Brian and Dee, hello, where are you? I remember you) chatted for a good half an hour or forty-five minutes with the keeper of the station at the top of the mountain. (Weather station? Government run, I know. He said. He was nice.) His station was one room, windows on all four walls. Nothing but sky. And bookshelves, a table, and quiet. He stayed up there all the time he said. He passed his time by reading and recording things. It looked like a very good way to spend a season or two. I envied him then and part of me envies him still. At the top of Mount Washburn, you can’t see the future. The air is thin but not that thin. You can see prehistory in the mountains in the distance; you can see the sun; you can see rock, and animal, and a sliver of the universe (and the station master’s book collection, which was extensive). You can’t see how quickly time after your hike will go. You can’t see that you will lose touch with Dee and Brian and your younger self. You can’t see how quickly the time will go, even though you had those mountains and the immense sky to warn and remind you. You can’t see that you should save the original photos and the negatives. Maybe someday I will hike to the top of Mount Washburn again. I’d like to think so. I’d prefer to do it with Dee, especially, though that doesn’t seem likely as we’ve lost touch and all. I’d also prefer to do it right before sunset so that all the way down, the sun and I can sink at the same time. Slipping below the horizon in tandem. If I do, you can bet I’ll take infinitely better care of the photographic evidence. Every sunset is special and unique. I can’t help but feel that this one, this one on Mount Washburn in 1994, is doubly lost. It passed and was lost that way. And then, due to one cruddy printer and one overzealous desire to organize and minimize, got lost again. Damn crazy kids. 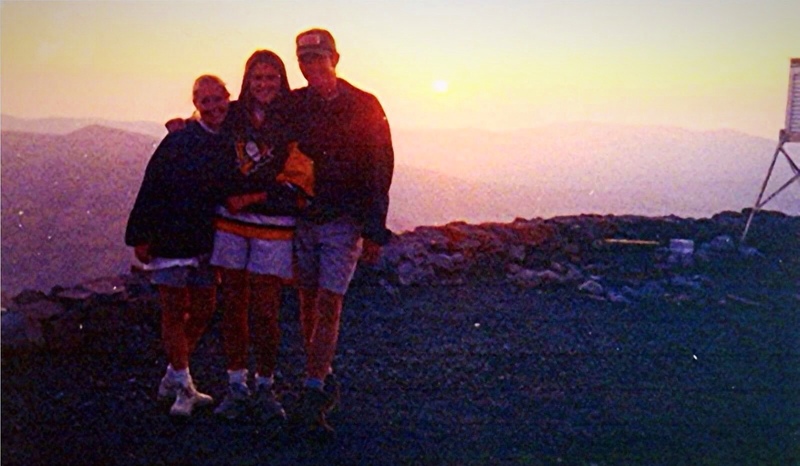 At the top of Mount Washburn, 1994.